Every day it seems that there is new evidence that Omega 3 fatty acids can alleviate depression, heart disease, Alzheimer’s, diabetes, and improve overall health. The Omega 3 supplement industry has soared. Clinical trials on depression use high doses of Omega 3 fatty acids and find that people struggling with depression get some relief. Omega 3s are important in brain function generally and the western diet has been rather deficient in the fat for the last century. What your best strategy is to improve your Omega 3 fatty acid status is to take an Omega 3 supplement and to add foods to your diet high in Omega 3 and low in Omega 6. 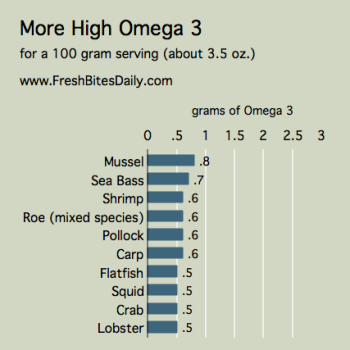 Here is the first part of the puzzle: Foods high in Omega 3 fatty acids. Notice that they are all in the fish family. A fascinating cross-national study on depression and one on postpartum depression by Joseph Hibbeln actually relates national consumption of fish to rates of depression. The less fish a country consumes, the more likely is that its residents suffer from depression. Here is the abstract for the postpartum study. Eating fish is a good way to get Omega 3 fatty acids and the Hibbeln studies suggest that the fish will help fight depression. Above are two figures listing the highest Omega 3 content fish and seafood. 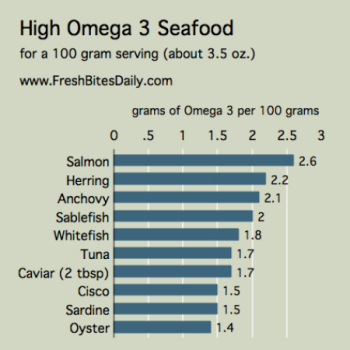 Keep in mind that these are the total Omega 3 content of the foods, not just EPA- the particular Omega 3 most effective at fighting depression. The overall Omega 3 content makes the point that fish is a real standout in this department. Grass fed beef has about 100 mg per serving. It is not in the same league. To find out which of your favorite seafood items have the highest content of the Omega 3 EPA, visit the USDA website and search their database or download their nice food database program. Put in your specific food and discover its full nutrient profile. For EPA, you are looking for the fatty acid that is listed as “20:5” – that’s the EPA lipid name. What About Toxins and Over-Harvesting? Increasingly we need to be concerned about toxins in seafood and the environmental effects of harvesting fish. The main resource I use myself to scope out the fish in the local Mexican markets is Monterey Bay Aquarium’s Seafood Watch. They provide information on a variety of fish, both nutritional and environmental issues. Find fish in your local market and then look it up on that site.